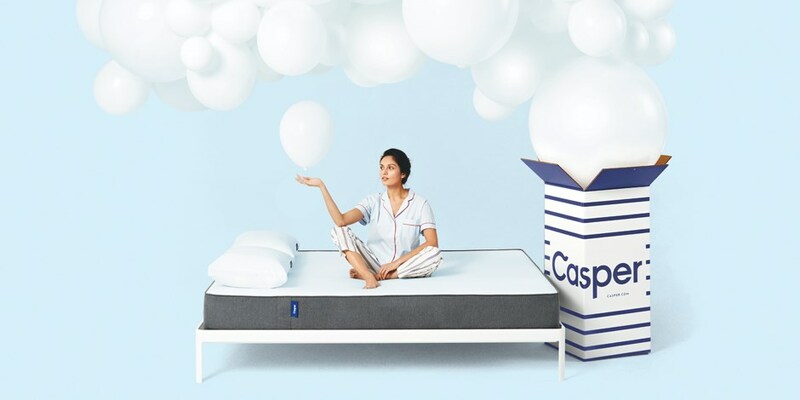 Casper and Purple brands enjoy immense success in the mattress industry nowadays. Both of them introduced comfortable and innovative mattresses. Many people are wondering which of the two is the better choice. Casper has been on the market for quite some time. While Purple brings a new technology in the mattress industry. Will Purple gain the top spot against the established Casper mattress? Let’s find out. Casper is the first of the two to appear in the market. It has been a popular choice for many households for a while now. They offer great design, quality, and comfort to their users. The Purple mattress is a new competitor. But, it offers several unique advantages that many people acknowledge. We tried to rate the mattresses with the following factors: support, cooling, motion transfer, and pricing. A proper mattress should support your weight properly. This is essential when you want to get a comfortable sleep every night. Your body holds a lot of weight when you are sleeping especially in areas such as the hips or shoulders. The mattress that can offer you with quality comfort and lots of layers should be the one that you should choose. The mattress should have a great edge support. In the mornings, you may not exactly be ready to jump out of your bed. You might need some time to sit on the edge of your mattress and needed a few moments in order to wake up properly. Some mattresses tend to sag on the edges when you sit on them for too long. Watch out for this kind of mattresses. Casper offers traditional support to sleepers. They have excellent thick foams that are great for heavy sleepers. Purple mattresses tend to sag and spring back after pressure is applied. They are great for light sleepers. A great mattress will be able to reduce your body temperature slightly. In order to go into deeper stages of sleep, you need to get a mattress that has a proper cooling effect. You don’t want to wake up all hot and sweaty because of your new mattress. The best mattresses apply gels, open-cell memory foam, and cooling layers to facilitate air flow. Casper mattresses offer traditional cooling effects. They have open-cell memory foams that are present in a lot of traditional mattresses. They are great for people who don’t sweat heavily while sleeping. Purple mattresses offer an advanced technology in terms of cooling effects. Motion transfer means the sleeper can feel the movement of other persons on the mattress. A great mattress has less motion transfer. This can mean that the movement is limited to a single person and the others in the bed won’t be affected as much. This means that if the sleeper has children, pets, or a partner, they will not be bothered with each other while sleeping. Motion isolation is important for people who are light sleepers. Casper is great for a person who sleeps alone. Casper does not offer motion isolation so it’s not best for light sleepers. Purple has great motion isolation. They are great for people who are light sleepers. Many people consider the prices before getting a mattress. You might find great deals on mattresses. However, they won’t be much help if they will make you feel hot and uncomfortable in the long run. If you find cheap mattresses that tend to wear and tear over time, you should change your foam as soon as possible. Beware of products that are too good to be true. In the battle of Casper vs. Purple, we are going to give you lots of information about the pricing. Casper is a great choice when you want affordable mattresses. They are great for people who are on a budget. Purple mattresses are more expensive. However, they can give you a great run for your money. On a scale of 1 – 10, and 10 is the highest number, here are our ratings for the Casper vs. Purple mattresses. These mattresses are delivered boxed and compressed. They offer house delivery service. The cover consists of white tops and grey sides made from polyester. With the Casper mattress, the top layer consists of one and a half inch of tall foam. They have an open-cell design that helps with body cooling at night. The second layer is made up of dense memory materials that are one and a half inch thick. The second level relieves pressure and helps the first level with the cooling process. The third layer is called the Zoned Support. This is a trademark of the Casper mattress. This is made up of a firm center where the sleeper’s hip rests. The upper and the lower part are made with soft materials in order to relieve the lower and upper extremities. Casper’s base layer consists of a 5-inch durable polyester support. The mattresses offer a great sinking feeling and support the body parts well. Casper mattresses are not ideal for heavy or overweight sleepers. They are not the perfect mattress for a hot night. There are slight signs of off-gassing. They might not be the right mattress for side sleepers. They do not give a great run for your money or you might find buying them too expensive without getting the benefit that you are looking for. These mattresses have a gel-like material underneath them. They are usually rolled into bags with convenient handles. They are also delivered to customer’s homes like Casper mattresses. The foam is made of polyester materials that are blended with Lycra and viscose. The first layer is made up of Hyper-Elastic Polymer which is a Purple trademark. This measures about two inches thick and it brings a neutral temperature. The buckle and cell bends give reliefs to the sleeper’s body wherever they are needed. The second layer consists of a 3.25-inch of polyester foam. The third layer is made up of 4 inches of polyester foam. This is the traditional support and foundation that can be commonly found in most of the world’s mattresses. The mattresses come with resilient top layer and bouncier surfaces. They are more breathable and durable. The cooling technology is one of a kind. The mattresses are great for any sleeping position. There are materials used that are non-toxic CertiPUR-US approved. They offer hypoallergenic mattresses to sensitive sleepers. Purple mattresses are lacking in terms of edge support. Purple mattresses have rated 6 – 6.5 in terms of the firmness scale. The scale covers firmness from 1 to 10, with 10 rated as very firm. With Purple, every sleeper can experience a different sensation. With people who weigh less than 130 pounds, they might experience a light floating feeling while they are sleeping. For people who weigh 130 to 150 pounds, they might feel a slight sinkage. This means that the heavier you are, the more hugs you can get with the Purple mattress. Casper has a score of 6 – 7 in the firmness scale. This mattress is designed to fit the different needs of most sleepers. The firmness of the mattress depends on the weight of the sleeper. If you are a heavy sleeper, you can feel a scale of 7 in terms of firmness. The sinkage in Casper foams is around 2.5 inches for light sleepers. The mattresses both have 9.5-inches in terms of thickness. The two mattresses are only available online. The two mattresses have two thin covers where you can engage with most of their layers. The two brands have the same firmness levels. They have great customer support and friendly return policies and trial periods. Both of them have great customer reviews. Both of them are made with durable and great fabric covers. The Purple mattress is bouncier and more resilient in terms of its top layer. The Casper mattress allows you to sink deeper when you want. Purple mattresses have a unique technology. The gel grid feels unique and it stays firm until the sleeper exerts pressure. After the pressure is applied, the mattress collapses. The Casper’s layers are balanced and compressed. This is common to foam and mattresses around the world. Casper mattresses have great cooling effects. Purple mattresses have the better cooling effect of the two and probably offer one of the best in the current market. Purple mattresses are more expensive than Casper mattresses. With the Purple mattress, users might notice a white substance that is visible on the pockets. Purple says that these are a proprietary plastic powder that they have created. The white powder prevents the mattresses from compressing and sticking together while they are being shipped. Purple says that these powders are not talc. They stated that Talc is a kind of mineral and their product lines do not contain any mineral whatsoever. The powder is not an inert substance and they are chemically inactive. This is a food-grade material. These are the same materials used in cooking utensils and plastic wares. The powder is completely harmless and 100% non-toxic. Shipping can take from 3-4 weeks. Shipping is free for all the 48 states in the US The warranty is 10 years. You can get a trial period of a hundred days and the mattress is made in the USA. The shipping can take from 2-7 business days. Casper mattresses are free if you live in the continental United States. This means that you might have to pay extra if you live in Hawaii. The mattress is compressed in a box and delivered directly to your home. The warranty is 10 days. You can have a trial period of 100 nights. There’s a refund of 100% money back guarantee if you are not satisfied with the product. Most of the products are made in the USA. Some of the border fabrics are imported from Belgium. Some of the covers are assembled in Mexico. Casper mattresses are ideal for people who like medium firmness. The mattresses offer the most traditional feel to many people. The memory foam composition plus the latex are ideal for light sleepers. The top foam does not offer much bounce, but it is great when it comes to supporting the back and stomach area of the sleeper. If you are on a budget, you can choose Casper foams. They offer quality mattresses and you can save some dollars on your choice. Casper foams are not for people who don’t want a sinking mattress. They are not a great choice for side sleepers and overweight people. If you are looking for luxury mattresses, these foams are certainly not a great option for you. For Purple mattresses, the cooling technology is ideal for people who sleep hot. It contains air pockets for a more breathable mattress. The improved circulation can help a lot of people sleep better. Purple does not have motion transfer, so you can sleep better even if you are not alone. Purple foams are not great for people who want to have innerspring and traditional mattress feel. The mattresses might be too soft and too bouncy for people. In Casper vs. Purple, it seems that the winner of this match is Purple. Many people can’t simply resist the cooling effect of the Purple product lines. Keep in mind that this review is not final. It all comes down to the buyer’s preferences. There are some people who might find Casper more comfortable than Purple. This can also be the opposite. The bottom line of this article is to help you make a great decision when you choose between the two. Now that you know the features and the advantages of the two mattresses, it is up to you to choose which of them can make you sleep better.